We are sooo “lucky” to meet so many different and great people and boats during our travels. 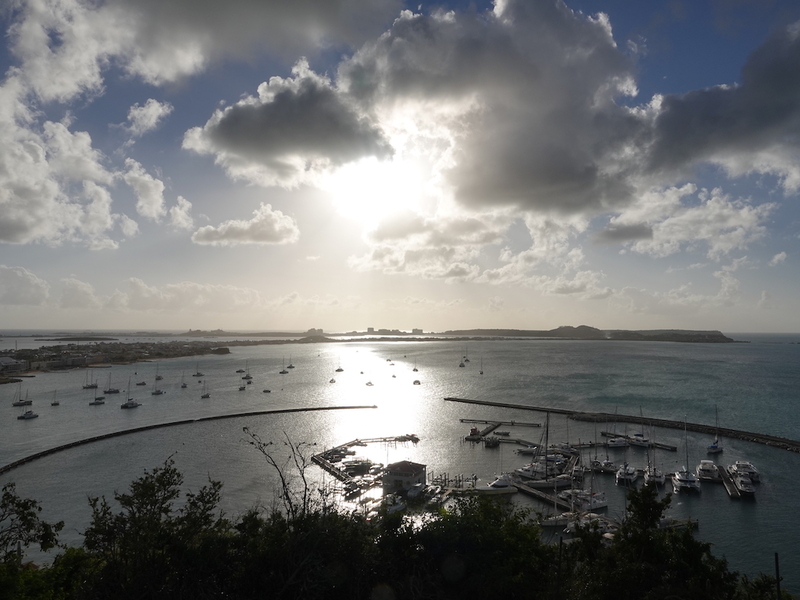 Since we are back in St. Martin, not only did we met some friends on other “cool” catamarans but also got the chance to catch up with some of the rally participants from last fall [Caribbean 1500]. By the way it is great to see that everyone is enjoying the Caribbeans. We had seen “Fujin” several times in the Caribbean and New England over the years and were always intrigued by her design. The boat looks awesome and fast. It was fantastic to meet Gina and Andrew and as a bonus we got a tour of the boat – very impressed and surprising. We wish them good luck for the upcoming regattas. “Difference” – to see her again was almost “sentimental” for Sebastien. Sebastien was the first captain and also followed parts of the build in Thailand. It was great to see the boat and discuss with Thibault the changes and modifications that have been done over the years. It’s always a pleasure to see Moonwave’s “sister” “Flow”. Tony is doing a great job on keeping her in “performance” shape. We had also seen her in the Grenadines for New Year and she looks great. “Flow” is more performance oriented with her bigger mast and curved daggerboards, ready to show off at the regattas. The other day we spotted a even bigger Gunboat at the anchorage in Marigot – similar color and lines as Moonwave – the Gunboat 78 “My Cat”. It’s great to see the boat in the water. We had last seen the boat under construction in the US a couple of years ago. Very nice and interesting to meet Cali and the crew – a young and dynamic team. We got a tour of the “beast” – same “basics” but everything is at least one size bigger than on Moonwave. Like they said in Thailand “same, same but different” – here it’s “same, same but bigger”. It was great to exchange and chat about the systems and equipments installed on board “My Cat”. Check out their website [in Spanish]. All those boats are “one of kind” and unique not only because of their design and systems but due to the care and “love” from their crews and owners. We are looking forward too cross paths again this season and in the future, meet old friends and make new ones on the way.